Schack Tati, a play on words around the Swedish for chess and French film maker Jacques Tati has all the implied impish humour the title suggests, which will be nothing new to fans of this long running Swedish musical partnership. 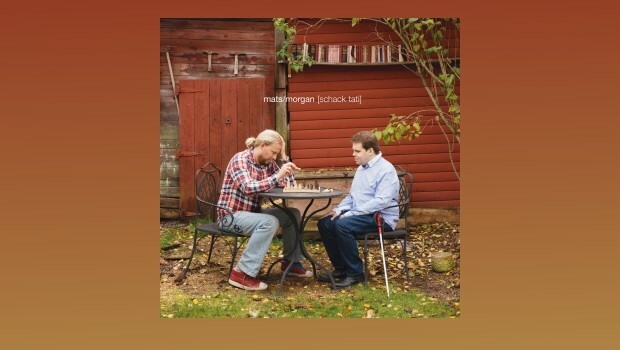 This is emphasised in humorously unsubtle fashion on the cover, where our duo are pictured playing chess outside a shack. Keyboard player Mats Öberg and drummer Morgan Ägren first performed together in 1981, when Mats was only 10 years old, and Morgan a comparative veteran of 14 summers. Both childhood prodigies, that first public appearance included covers of Zappa and Beatles songs, and by 1984 the duo had formed a Zappa covers band, an impressive feat for players so young. Schack Tati is the duo’s first new album since 2005’s Thanks For Flying With Us, and it goes SPPPRROINNGGG, like a bungee cord attached to a moon rocket as it flits about in time-honoured Mats/Morgan magpie fashion. Taking elements of jazz, rock, world music, electronica, dance music and no doubt, the kitchen sink, the end result is immediately identifiable as the sound that only Mats/Morgan can make. Blind from birth, keyboard player Mats displays an intuitive control of the technology at his fingertips, crafting layers of sound under, over, and in between Morgan’s subtle and complex rhythms, some programmed, some au naturel. Morgan has been called “the Ingmar Bergman of drums” by French drumming mag Batteur Magazine. I’ve no idea what is meant by that, but it sure sounds good! With the addition of Morgan’s off-kilter falsetto vocals, opener Rubber Sky espouses the fun nature of this record as it jumps about on a trampoline, an airborne collision of the Hatfields and Depeche Mode. Simon Steensland, who is also the recording engineer for the album contributes his keyboard to the dizzying soundscape of Walk Here and by now we know that this record isn’t about to sit still for a second. The PR blurb describes Rappel as a “frenzied polyrhythmic mindfuck”, and it ain’t wrong. The album borrows and reinvents techno rhythms, and it is sometimes not at all obvious which beats are computer generated and which are coming from Morgan’s freewheeling hands. Occasionally we need a rest, and tracks such as Mr. Piccand grant us that wish, here leaving the listeners in an alien ambient-jazz room, caressing our ears with soothing but wilfully odd electronic ephemera from Mats’ array of techno-gadgetry. This also happens to be the longest track on the album, at a not over-taxing six minutes and a bit, so we emerge fully blissed-out. What was it the PR sheet called Rappel?…Oh yes, that’s right. Prepare to have your cerebral cortex inverted as the monster is let loose in the candy shop. The Zappa influence is there, but even he was never this eclectic. This is bonkers music, but it works. Thrown in with rest Schack Tati the album no doubt reads as if it is a bit of a mess, but that is not the case. Schack Tati as an entity is a cogent whole, without ever really revealing what holds it together. This is a concert hall built on the surreal estate, music for Dadaists to cut a rug to in the Cabaret Voltaire. It is also a very dense record which might put off the less adventurous, but this duo are ploughing their own furrow and have been for years, so I doubt that enticing new listeners is anywhere near the top of their “to do” list. The other track featuring a guest is DJ Fetisov, starring the voice of the man in the title. Is he a DJ or they his initials? No matter; the stuttering time signature looped on the keyboard provides a sparse backdrop for techno beats and space whispers until Mr Fetisov contributes some spoken and semi-sung voice, and then things start crawling up the walls. Suitably odd, and I have not a clue what is going on, but it makes me tap my toes. The Curse Of Knowledge can be that one comes across as too clever by half, but these boys are having way too much fun to let po-faced intellectualism blind them to the benefits of an irresistible beat and an insane melody that worms its way into the brain. Old-skool prog synths feature on this one, atop more collapso-modernistic rhythms, as the tune darts about like an agitated hoverfly. Russian Tourists Not In Line holds a dark distorted mirror to Zappa and avant jazz noodling, but needless to say it is all done in the best possible taste. The closing title track briefly reprises Morgan’s “singing” and builds a tune on a surprisingly straightforward beat, multiple keyboards and synths weaving in and out. The tune ends with more of Morgan’s falsetto sub-Hatfields warbling, and there you have it; a breathless switchback of an album that is difficult, yes, but only as much as you want it to be. You could even jig about to this doing the ironing, if that’s your bag’o’nails!